Getting a new job, is like getting one step closer to your success marvel. You witness new found things, you suddenly start feeling responsible. Days that embarked carefree attitude and no obligations to be fulfilled, turn into days where discipline and deadlines defines your niche. 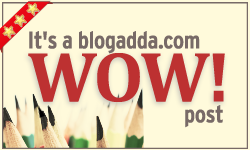 This week's WOW prompt was "My First Job" and our bloggers entwined beautifully their first getaway in the world of competition. Thank you so much for sharing your real life story with us. We appreciate your hard earned job and wish you all the best for your future!